Common Core standards are asking us to use more non-fiction in our classes, which is fine with me (the allocation of limited resources to big business i.e. extensive testing is another story). I love interdisciplinary units that allow students to demonstrate how they shine in other classes and, given that there are so many cognates when talking about science, this is a lesson that can be comprehensible to lower levels. This lesson may be of particular interest to anyone who lives on the West Coast (extending up to Alaska), or students with an interest in the natural world. (1) Students identify prior knowledge about whales in small groups using a Venn diagram. 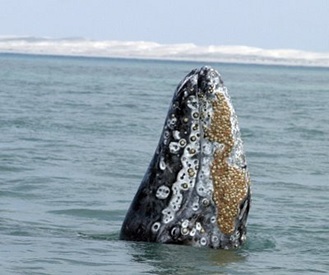 This lesson was part of an ongoing unit exploring human interaction with the natural world; we chose to compare and contrast ballenas with murciélagos (both are mammals), but you can compare and contrast whales with humans instead. Once students realized that both are mamíferos then they had plenty to say. As I walked around I wrote cognates and a few key words that they needed on the board. (2) I PRESENTED THIS POWERPOINT which has an embedded video and plenty of great visuals. If you want the video you’ll have to download it and embed it separately; FOLLOW THIS LINK TO GET THE VIDEO TO EMBED INTO THE POWERPOINT. In order to embed a youtube video into a powerpoint you have to convert it to an .mp4 or .wmv (there are plenty of programs online that will convert it while you download it). My students took notes on the presentation as if we were in an old-school science lecture class. As a science class it may have been lacking, but as a language class there was plenty of comprehensible input and my students really seemed to enjoy the change of pace. 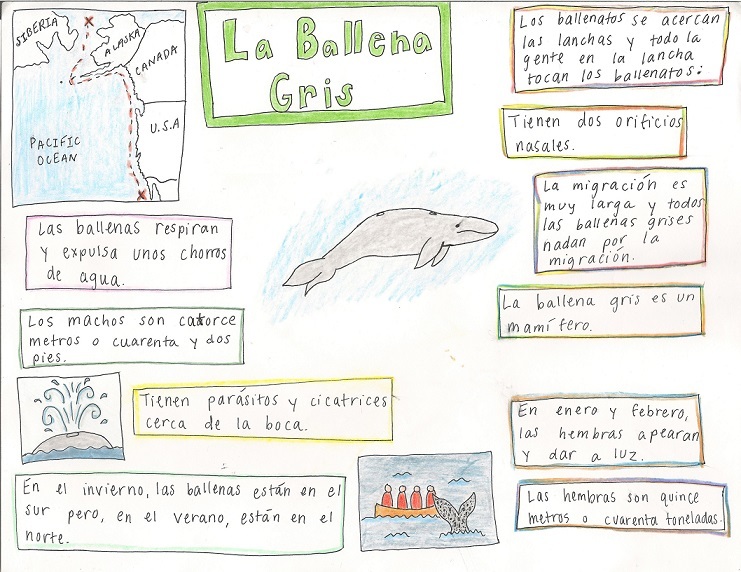 Steps 1 & 2 took one full period, so for homework they made little posters about the grey whales that migrate from Alaska to Baja California. They had to include ten fun facts in Spanish and three illustrations. (3) As a warm-up the next day to review what we learned in the previous class I had an online game projected for the whole class to see. CLICK HERE TO PLAY THE ONLINE GAME. Students were excited to see who could be the fastest. (4) Watch THIS VIDEO using the Movie Talk method. This step could easily take an entire class period. Click here if you want to learn more about Movie Talk . Optional step: If you like you can also embed the video into a powerpoint that is timed to caption much of the video and then watch it again either at the end of class or at the beginning of the next period. Students will be AMAZED at how much of the narration that they can now understand. In order to embed a youtube video into a powerpoint you have to convert it to an .mp4 or .wmv (there are plenty of programs online that will convert it while you download it). Once you have the file, embed it into this powerpoint file: rewatch video now with subtitles in ppt. (5) Quick freewrite (10 minutes). I gave them a writing prompt and they wrote without any resources. At this point we were getting tired of the non-fiction, so my prompt encouraged creativity. I blogged earlier about this and you can see one of my student’s response in THIS BLOG POST. (6) Mitos y leyendas: Nelly Hughes created this extension activity (click here to download as a .pdf) that explores myths about whales in various cultures. Her work is fabulous!!! HERE IS A LINK TO THE VIDEO and, if you choose to embed the video into a powerpoint, here is the powerpoint file with all of the lyrics and timings set-up: LYRICS TO ENTRE SALITRE Y SUDOR . I’m a second year Spanish teacher using the TPRS and TCI methodology and loving it in my Spanish 1 and 2 classes (and always looking for ways to improve, so thank you for all of your resources!). Next year I’ll be teaching Spanish 3 for the first time and I was wondering if you structure your Spanish 3 year similarly to your AP class, by themes, and what that looks like. I have a ton of ideas from reading and researching but know that I need a better way to organize them. I’m very interested in incorporating FVR and would like more ideas for stories to tell at this higher level that will still keep my students very engaged. I still teach lots of stories and music. Sometimes I invert the three steps and students read a very simple story first that teaches no new structures, but then through storyasking afterwards (to expand upon the story) I explore structures with advanced grammar. For example, if a character gets a knife to cut a rope in the story then I might ask (in Spanish) What if there were no knife? (¿Y si no hubiera navaja? ¿Qué haría?). Writing on the board with translations, just like for level 1, we play with the structures until they are acquired. And El Internado, of course. FVR becomes much more important in my 3rd year classes; this summer I will presenting at NTPRS about how to scaffold a new FVR program. If you cannot make it to NTPRS in DC then my power point will be posted later this summer on my website.